I got a quick look at a pair of EA iPhone games yesterday, one that gave just about the best first impression of EA's spring line-up. That's the Canabalt-ish return of Mirror's Edge. Signed documents prevent me from sharing the control intricacies of Mirror's Edge or even much of a description of the game, but I will share that this is an iPhone game to watch. It is a re-make of sorts of the first-person free-running console game of the same name. Mirror's Edge on iPhone is a side-scroller that appears to reward players who can propel its heroine's perpetual motion across a beautifully white-washed urban landscape. The first game I thought of while trying Mirror's Edge on iPhone was Canabalt, the beloved (by us and others) indie side-scroller that features a hero who automatically and urgently runs away from disaster, jumping from rooftop to rooftop, as far as long as the player can keep him alive. 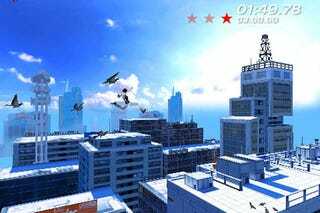 Mirror's Edge may be more of a traditional game than that, with levels and enemies, but the very first thing I witnessed in the iPhone game was our hero Faith propelled into — ideally — perpetual, accelerating motion across roof-tops. It didn't seem like a rip-off but more of another entry into what could prove to be an enjoyable new genre of rapid platforming. We'll have more impressions of Mirror's Edge later this month. The game is scheduled for April release. Also worth keeping an eye on is EA's Skate-It, a skateboarding iPhone game modified from a DS title of the same name. That one is set for release later in the spring.